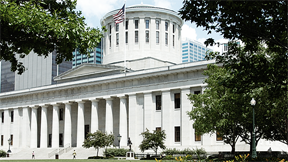 Each year the Ohio Legislative Black Caucus Foundation, a non-profit, non-partisan organization, hosts an event to recognize the contributions of African American legislators and to honor corporate colleagues who have invested in the advancement of the African American community. The Ohio Legislative Black Caucus was founded in 1967 by African-American state legislators under the leadership of State Representative C.J. McLin of Dayton, Ohio. Ohio Legislative Black Caucus - "A Celebration of African American Women"
Ohio Legislative Black Caucus - "Leadership in Challenging Times"
Ohio Legislative Black Caucus - "Seeing Beyond"